Exclusive — A security researcher has identified an unsecured server that was leaking detailed personal details of nearly half a million Indian citizens... thanks to another MongoDB database instance that company left unprotected on the Internet accessible to anyone without the password. 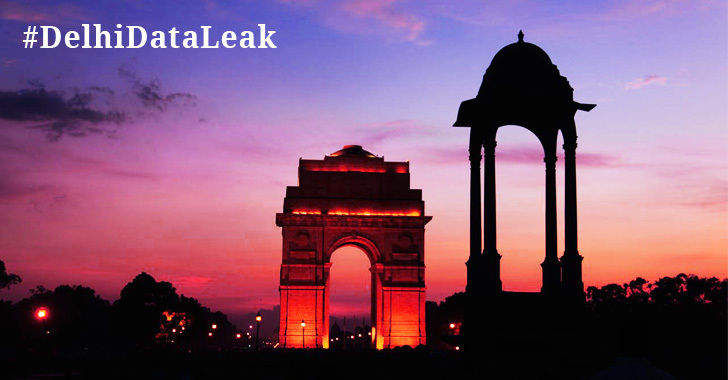 In a report, Bob Diachenko shared with The Hacker News, disclosed that two days ago he found a 4.1 GB-sized highly sensitive database online, named "GNCTD," containing information collected on 458,388 individuals located in Delhi, India. 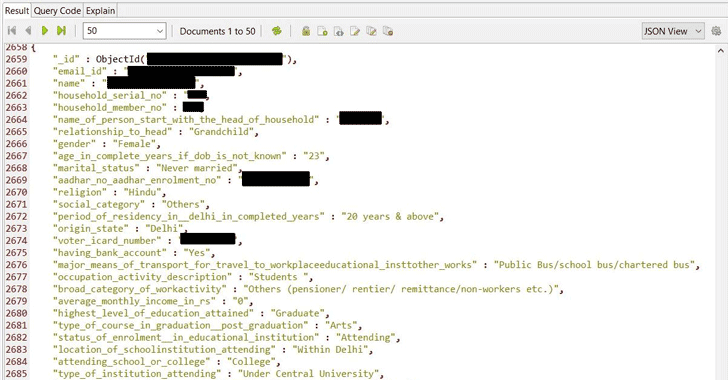 Though it's not clear if the exposed database is linked to Government of National Capital Territory of Delhi (GNCTD), Diachenko found that the database contains references and email addresses with "transerve.com" domain for users registered with "senior supervisor," and "super admin" designations. Based upon the information available that website, Transerve Technologies is a Goa-based company that offers geospatial technology-based SaaS solutions and specializes in smart city solutions and advanced data collection technology. The company's data collector, location intelligence and precision mapping tool help businesses and Governments to utilize Geo-location data to make smart decisions intelligently. "It remains unknown just how long database was online and if anyone else accessed it," Diachenko said. 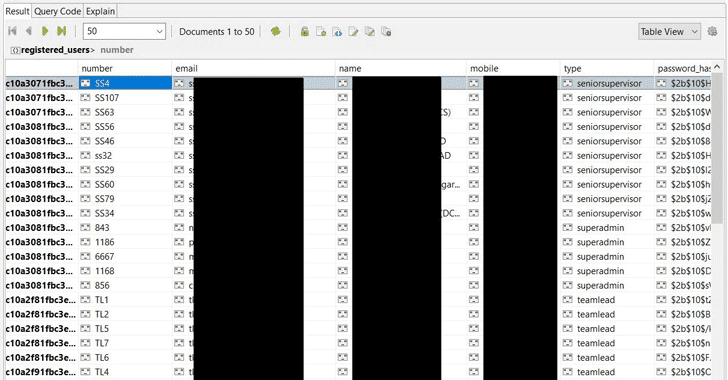 The database table containing registered users includes email addresses, hashed passwords and usernames for administrator access, as analyzed by Diachenko. "The most detailed information contained in 'Individuals' collection which was basically a pretty detailed portrait of a person, incl. health conditions, education, etc.," Diachenko said. 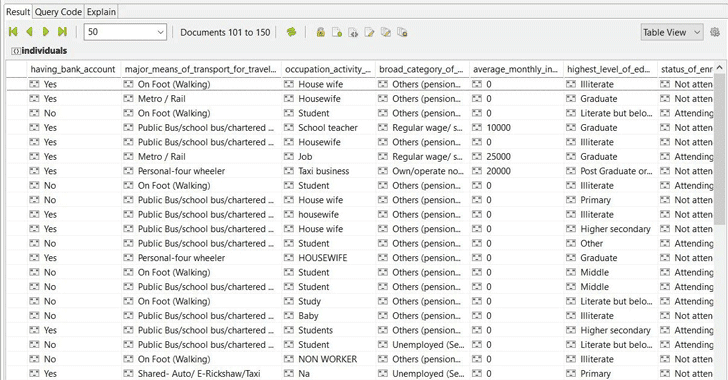 "Households collection contained fields such as 'name', 'house no', 'floor number', 'geolocation', area details, 'email_ID' of a supervisor, 'is the household cooperating for survey' field, 'type of latrine', 'functional water meter', 'ration card number', 'internet facility available' and even 'informan name' field." When Transerve didn't respond to responsible disclosure sent via email, Diachenko contacted Indian CERT, which further coordinated with the company to take its exposed database offline immediately. "The danger of having an exposed MongoDB or similar NoSQL databases is a huge risk. We have previously reported that the lack of authentication allowed the installation of malware or ransomware on thousands of MongoDB servers," Diachenko said. "The public configuration allows the possibility of cybercriminals to manage the whole system with full administrative privileges. Once the malware is in place, criminals could remotely access the server resources and even launch a code execution to steal or completely destroy any saved data the server contains." MongoDB is the most popular, open-source NoSQL database used by companies of all sizes, from eBay and Sourceforge to The New York Times and LinkedIn. This isn't the first time when MongoDB instances are found exposed to the Internet. In recent years, we have published several reports where unprotected database servers have already exposed billions of records. None of this is MongoDBs fault, as administrators are always advised to follow the security checklist provided by the MongoDB maintainers. On older versions of MongoDB before version 2.6.0, the default configuration makes the database listening on a publicly accessible port, where admins are supposed to reconfigure it appropriately for online use, but, unfortunately, many don't.